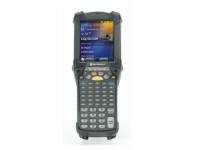 Building on the successful MC3000 mobile computer, the rugged wireless MC3100 Series brings cost-effective anytime mobility to key-based applications within the four walls — in the retail store and warehouse aisles, on the loading dock and out in the yard. Leveraging Motorola’s new Mobility Platform Architecture 2.0, the MC3100 offers advanced computing power, industry-leading data capture capabilities and superior ergonomics. In addition to the processing power and memory required to support advanced applications, the MC3100 also offers the latest in mobile technology and security. An integrated RFID tag automates asset tracking, allowing enterprises to track and locate MC3100 devices right out the box. Motorola’s Interactive Sensor Technology (IST) provides an integrated accelerometer that enables leading edge motion-based applications that improve power management and more. Robust security features include FIPS 140-2 certification, protecting the most sensitive data. Compatibility with the existing MC3000 accessories ecosystem enables organizations to upgrade to the latest in technology, while preserving the existing accessory investment. The result is a robust affordable device that will help retailers, government agencies and distribution centers streamline and error-proof business processes, improving employee productivity as well ascustomer service and satisfaction. The MC3100 is purpose-built for demanding environments within the enterprise walls. The superior rugged specifications dramatically reduce repair and downtime, delivering an exceptional return on investment (ROI) and total cost of ownership (TCO). Designed to easily handle the inevitable everyday drops and bumps, the MC3100 passes Motorola’s stringent mechanical design tests for both stress and endurance. The device survives multiple 4 ft./1.2m drops across the entire operating temperature range and continues to deliver dependable performance, even after 500 consecutive 1.64 ft./0.5m tumbles (1,000 hits). IP54 sealing ensures reliable operation in dusty environments — as well as the ability to endure exposure to liquids and wipe downs. No matter what type of data you need to capture, you can count on superior performance. Choose from the Symbol SE950 1D laser scanner or the Symbol SE4500 1D/2D imager. 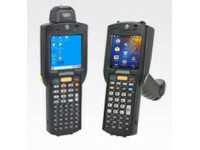 The SE950 enables rapid and accurate capture of all 1D symbologies — including damaged and poor quality bar codes often found in the warehouse or retail aisles. And the patented Liquid Polymer scan element eliminates friction and wear for superior durability and reliability. If your business data is more diverse, the SE4500 imager enables the capture of 1D and 2D bar codes as well as direct part marks, still images and documents. While typical imagers provide the flexibility to capture both 1D and 2D bar codes at the cost of 1D bar code performance, the revolutionary SE4500 redefines imaging technology, offering laser-like performance on 1D barcodes — and equally stunning performance on 2D bar codes. The MC3100 is loaded with security features that provide peace-of-mind for wireless LAN communications. FIPS 140-2 certification and support for the most advanced encryption and authentication algorithms ensure the security and integrity of your wireless transmissions, in addition to protecting access to the wired network. The result is compliance with the most stringent industry security regulations, meeting the requirements for use in government and other applications with highly sensitive data. The MC3100 offers a powerful new capability, Motorola Interactive Sensor Technology (IST), which provides support for a world of new motion-sensing applications that deliver rich business value. Power management features enable the device to automatically revert to sleep mode if movement is not detected in a specified period of time, or if the display is face down. The display can dynamically switch between portrait and landscape, based on the orientation of the device. The ability to detect and log drops increases worker accountability. In addition, the open architecture allows organizations to access and integrate accelerometer data into customized applications, enabling enterprises to more fully leverage the value of interactive sensing technology. Another unique feature of the MC3100 is the integrated UHF RFID tag, allowing enterprises tomore fully leverage existing or planned RFID deployments. The integrated RFID tag enables businesses to automatically track the movement and location of their mobile computers. Maintaining a real-time inventory of your MC3100 mobile computers is literally effortless — and misplaced devices can be located quickly and easily. Six different models of the MC3100 are available, allowing you to mix and match devices to best meet the needs of your users and your applications. First, choose the form factor that is best for your application: straight-shooter, gun or turret. The straight-shooter is ideal for standard scanning applications. The gun provides all day comfort for scan intensive activities. The turret provides the flexibility to adjust the scanning position, improving user comfort. All three models offer a choice of operating systems. 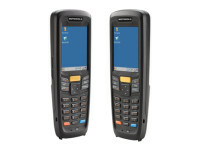 Microsoft Windows Mobile 6.X Classic provides users with a familiar and intuitive interface that significantly reduces training time, while Windows CE 6.0 Pro provides a robust programming environment to support the development of rich custom applications. The industry standard MC3100 Series easily integrates with your existing technology environment — including your wireless LAN (WLAN). 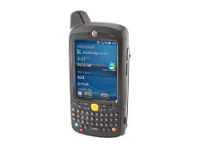 Since the MC3000 and the MC3100 as well as many other Motorola mobile computers share a common architectural platform, porting existing applications from other Motorola mobile computers to the MC3100 is fast and easy. Additionally, Motorola’s robust award-winning partner channel provides access to a world of well-tested best-in-class line of business applications. The result is a substantial reduction in application development time and costs, enabling rapid deployment, improving the return on investment for existing applications and providing a cost-effective path to upgrade to the latest mobile computing technology — with minimal business disruption. 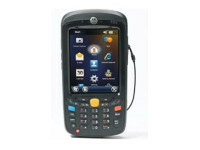 As the interface between your workers and your applications, the keypad is at the heart of mobile worker productivity. To achieve maximum productivity in your mobile workforce, the keypad must maximize data entry simplicity. The MC3100 offers a variety of keypads designed to meet the needs of virtually any type of application — from heavy text entry to calculator-style numeric data. When you choose the Motorola MC3100, you enjoy the advantages of a world-class partner channel, world-class management solutions and world-class services. Motorola’s Mobility Suite offers comprehensive management solutions that provide extraordinary centralized control of your MC3100 and other Motorola mobile computing devices, driving device management costs to a new low. For example, Motorola’s Mobility Services Platform (MSP) enables remote staging, provisioning, monitoring and troubleshooting of your Motorola mobile computers, regardless of where in the world they are located. The Motorola Mobility Suite also includes a Mobile Virtual Private Network (MVPN) for secure communications as well as multiple software tools and developer kits. In addition, Terminal Emulation (TE) clients provide access to legacy applications (pre-licensed on the MC3100-G).In addition, Motorola’s Advanced Services are available to assist you with any stage of development of your mobility solution — from planning and assessment through system design and deployment. And once your mobility solution is deployed, our Customer Services keep your products up and running at peak performance. For the MC3100, Motorola recommends Service from the Start with Comprehensive Coverage. This exceptional service is truly comprehensive, providing technical support and end-to-end protection for your device. Normal wear and tear, internal and external components damaged through accidental breakage and select accessories that ship together with the MC3100 are all covered – for no additional charge. The MC3100 is warranted against defects in workmanship and materials for a period of 12 months from date of shipment, provided that the product remains unmodified and is operated under normal and proper conditions.